Goodman shared some of the findings from her 2014 Internet Voting Project with the Committee. And, to coincide with today’s presentation, the Centre—an independent not-for-profit organization dedicated to initiating, translating and disseminating academic research and knowledge on the impact of digital technologies on politics and democracy—is making the full report available for download on its website at centreforedemocracy.com. The study conducted out of the University of Toronto and funded by the Social Sciences and Humanities Research Council (SSHRC), surveyed voters, candidates, and election administrators in 47 of the 97 municipalities that offered Internet voting in the October 2014 municipal elections in Ontario. The report provides detailed analysis of the overall findings from each survey group and includes lessons learned for future Internet voting development at the municipal level in Canada and elsewhere. 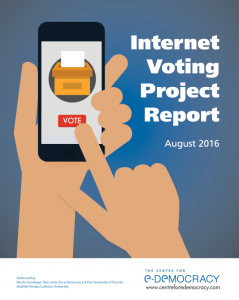 To obtain a copy of the Internet Voting Project Report in its entirety, please visit the CeD website at centreforedemocracy.com. The Centre for e-Democracy is a not-for-profit organization dedicated to initiating, translating and disseminating research and knowledge on the impact of digital technologies on politics and democracy. Founded by Delvinia CEO Adam Froman in collaboration with Nicole Goodman, PhD, the Centre is the first of its kind in Canada and will be a hot spot for e-democracy research with aim of making a real, practical impact on Canadians’ knowledge and understanding of the use of technology in society and politics. For more information about the Centre, or to donate to the organization, please visit centreforedemocracy.com. The Internet Voting Project seeks to shed light on the effects of Internet voting on elections by surveying voters, candidates, and election administration in Ontario municipalities that offer Internet voting in the October 2014 elections. Survey questions probe voting histories, political attitudes, thoughts about Internet voting and the election experience, opinions about changes to the local campaign, knowledge and use of computers, and access to and familiarity with the Internet, among other items. Forty-seven municipalities chose to participate in this study. For more on the Internet Voting Project, please visit internetvotingproject.com. The Munk School of Global Affairs at the University of Toronto is home to more than 35 programs of advanced research and education on the challenges, organizations, and ideas that are reshaping the global landscape. Munk School scholars tackle global problems in research labs on the geopolitics of cyberspace, innovation policy, environmental governance, and global justice, and through a flagship professional Master of Global Affairs. The Innovation Policy Lab (IPL) is a hub within the Munk School whose mission is to study, teach, and apply novel methods and disciplines to the study of innovation and its impact on society. For more information, please visit: munkschool.utoronto.ca.